First Solar, which makes cadmium-telluride solar panels, plans to offer rebates to customers in Germany to better compete with producers of silicon panels. Is First Solar in danger of losing its title as the king of the low-cost solar panel? The Tempe, Ariz.-based company said Thursday it plans to set up a rebate program in Germany, one of its largest markets, in order to better compete with companies that have sharply lowered their panel prices as a result of a rapid decline in silicon pricing. "Across Q2, we observed some aggressive pricing behavior on the part of some manufacturers in order to drive sales into the German market," said Michael Ahearn, CEO of First Solar, during a conference call to discuss the company's second quarter earnings. The company delivered strong financial results. "We will discount if necessary to defend our position in this core market." The pricing war has caused some project investors and developers to defer making buying decisions as they wait to see "how the price reductions play out," Ahearn said. The announcement from one of the world's largest solar panel makers seemed to have caused some concerns among investors. First Solar's shares dropped about 3.4 percent to reach $167.60 per share in after-hour trading. First Solar expects the rebate program to contribute to a smaller gross margin for the rest of this year, said Jens Meyerhoff, chief financial officer of First Solar. The company would dole out the rebates only after its panels have been installed, Meyerhoff said. The incentives would apply to commercial rooftop and ground mounted projects. First Solar would track silicon pricing closely to determine how much it would offer to its customers, Ahearn said. The company would run the program as long as it deems necessary, he added. For months now, analysts and solar companies have wondered about the impact of silicon pricing on First Solar, which uses cadmium-telluride instead of silicon for its panels. Silicon prices have fallen significantly over the past year. In fact, the long-term contract price has dived about 50 percent, close to the spot market price of $67 per kilogram, or about $0.50 per watt, said the London-based New Energy Finance earlier this week. Silicon used to fetch more than $300 per kilogram on the spot market and $150 per kilogram for long-term contracts a few years ago, when solar companies competed with chip makers for the raw material. Silicon producers began to build new factories. The worldwide financial market crisis, which has lowered the demand for solar panels over the past 10 months, has caused producers to slash their prices. 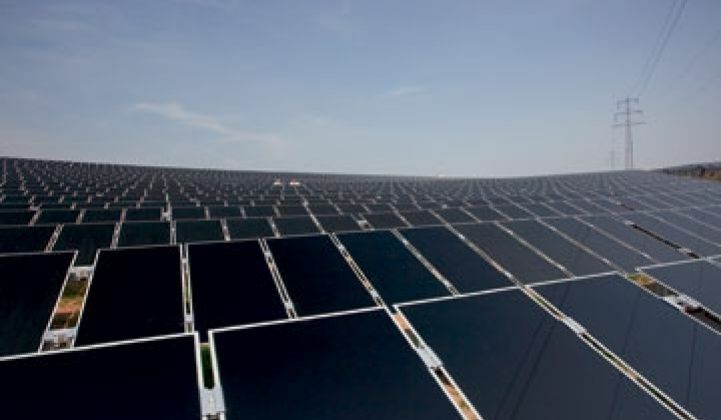 Many of the large silicon panel producers are based in China, such as Suntech Power and Trina Solar. Many silicon solar panel have renegotiated or even canceled their contracts, New Energy Finance said. First Solar has stood out as the only non-silicon player who occupies a spot on the list of top 10 solar panel makers worldwide. The company has won lots of admiration from investors and even fellow competitors for its ability to keep manufacturing costs low while producing good products. In fact, First Solar was able to lower its production cost by 6.5 percent from the first quarter, the company said. The manufacturing cost reached $0.87 per watt in the second quarter. The company reportedly is selling its panels at below $2 per watt while silicon panel makers are selling theirs at roughly $2.25 to $2.50 per watt. But its pricing lead is likely shrinking. New Energy Finance said the silicon prices are low enough that major panel makers could sell their products at below $2 per watt and still "make a small profit." While many of its competitors have seen revenue declines or even losses, First Solar has continued to improve its financial results. The company reported $525.9 million in revenue for the first quarter, up from $418.2 million in the first quarter and $267 million in the second quarter of 2008. The company posted $180.6 million in net income, or $2.11 per share, for the second quarter, compared with $164.6 million, or $1.99 per share, for the first quarter and $69.7 million, or $0.85 per share, in the year-ago period.